I have been a scratch builder of many years. I started at the age of eight, and I’m now eighty four. I started before WW2, using s fret saw. I made many models out of an old Tea chest. 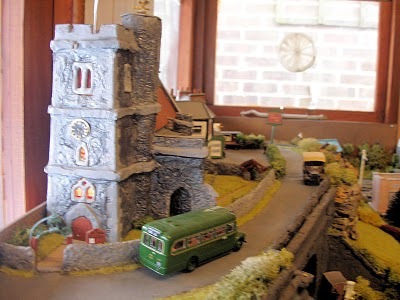 After serving in the war I didn’t really take scratch building seriously until 1951 when I went into Model Railways for my sons. 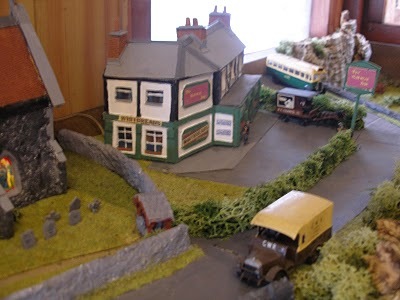 Since then we have built 5 layouts, largest 6feet by 10 feet, but they have left home now and with a 6X4layout I go it alone, with visits from my grandchildren and great grandchildren. 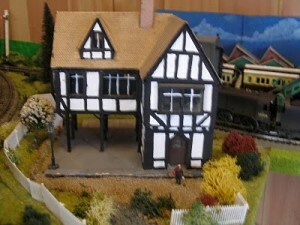 I’ve just purchased and read your Model Train Help E Book, which I found most interesting. Here is my explanation of Stone type modeling with pictures of some of the models I’ve made using this method. 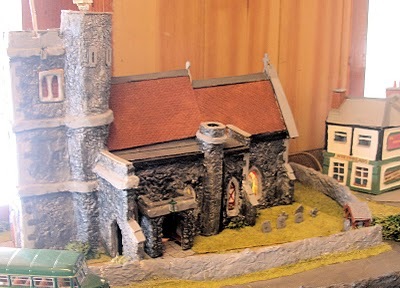 You can scratch model buildings and walls to give the Stone type effect by using Powdered Poly filler, or powder wall plaster. Before you start building you need a plan of your building, I first take a photos at different angles of the building I want to model, then sketches are made of the parts you need for the building. 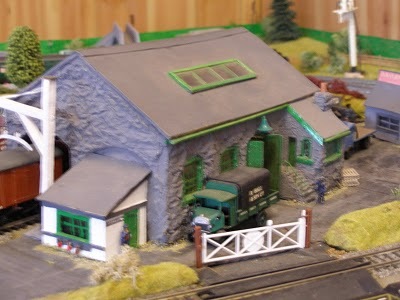 First you need to cut out the building walls to the Railway gauge size you are using, (I work in the 00 gauge, 1:76.2), also cut out the window and door openings. From hard board, (use the rough side), Balsa wood or a thick Cardboard, (no less than 1/8 thickness), something the plaster will adhere to. Next, make up window and door frames, and glue these onto the out side of the of the board, also at this stage add a fascia boards to take any guttering, (don’t forget outside chimney breast), glue the sides together forming the shape of the building. You may need to put inner walls at this stage, or Corner formers to strengthen the building. Once the building has stuck and can be handled, mixed up some poly filler (plaster) to a sticky paste (not to wet). Spread this over the wall sides to the thickness of your window & door frames, then without the Wife, Partner or Mother knowing, go into the kitchen and get the “Kitchen Foil wrap”. Cut this to the shape of the walls allowing a bit extra around the outside edges, crumple it up so it is well creased, flatten it out & press lightly onto the damp plaster, then leave to dry. Once dry, (properly next day), peel the foil of, you should be left with a stone looking wall, clean off the edges and any spare plaster that has crept over your frames etc:, you can then if you wish mark out the stones with a pointed tool, or you may leave it as it is & just paint it the stone color you want. Next paint the door and window frames, & when dry you can add you Perspex for you windows, curtains doors etc. You then need a roof, this can be made to your board type your using, covered with Tiling paper, or I have found the back side of hardboard has a etched markings on it that when painted a dark red looks realistic, or with plenty of time and patience, put a layer of plaster on the roof, smooth it out nice and flat, then when dry, mark out a slated type roof. Photo above shows a Goods Shed. (Point of interest, is the lamp over the main double door is from the stem holder of a British Legion Remembrance Poppy, making use of thinks around you). If you are making an Elizabethan or Georgian type building, when putting in the frames adds you beans, balsa wood is good for this, remembering the plaster is smooth between the rafters. Don’t forget outside fittings such as down pipes, guttering, chimney’s etc. This a country Public House & has lights (photo above). If you are making walls of the stone type use the same method, rapping the foil over the top of the wall covering both sides, when dry remember some of these walls have the top layer of stones vertical. If you need bends in the wall, I suggest you use card board for the wall so that you can bend it to shape, and I found it best to glue the shaped card board to a card base so that it maintains its shape, before adding the plaster. Any matt paint can be used but I have found acrylic best. Lot of patience is needed but I have found that the results have been very satisfying. This Church has lights and a module for a peel of Church Bells up. Thanks to Laurie for this excellent contribution. I’m sure others in the hobby will benefit greatly from his ideas. It would be great if others in the hobby would contribute ideas as I know there many regular readers who have considerable experience in the hobby and could be of tremendous assistance to others in the hobby.